According to the organizers, 435 companies from 13 countries exhibited at the three trade fairs. 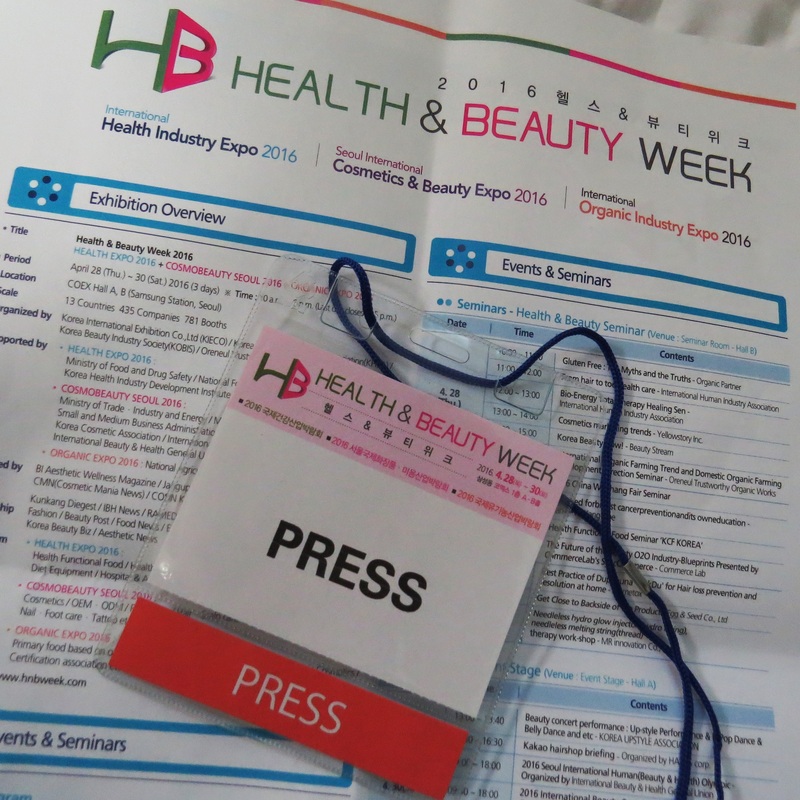 With some 280 exhibition stands, Cosmobeauty (Hall A) was by far the biggest trade show while Organic Expo and Industry Expo (Hall B) accounted for some 125 booths. My primary focus was the cosmetics trade show but I also checked out the organic food exhibitors (I’m writing a trade show review about Organic Expo for Organic & Wellness News. 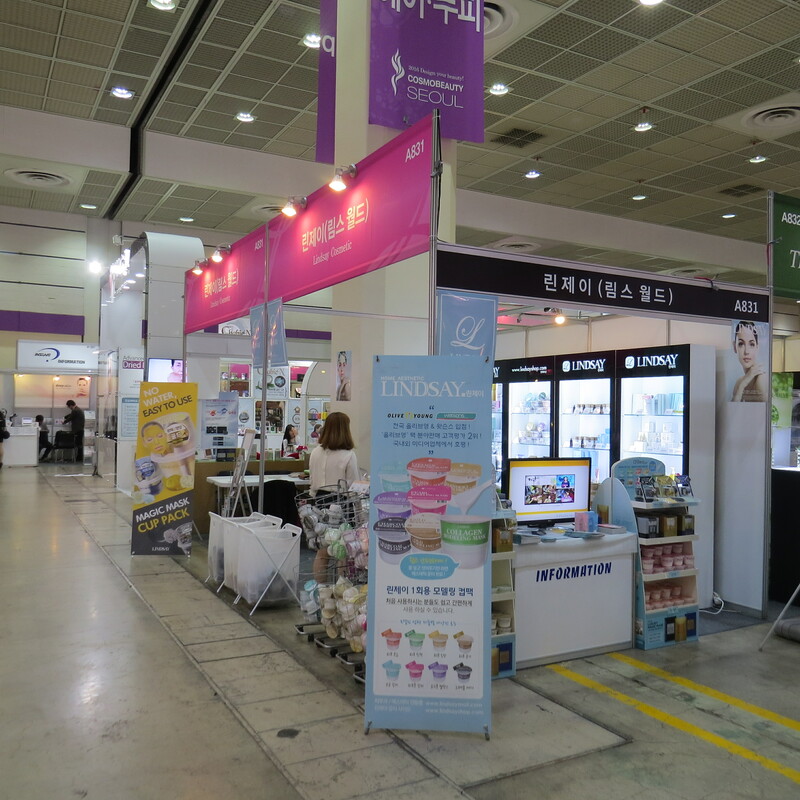 Anyway, Cosmobeauty is my second Korean trade show; the first trade fair I attended was 13th International Beauty Expo Korea in October 2015. 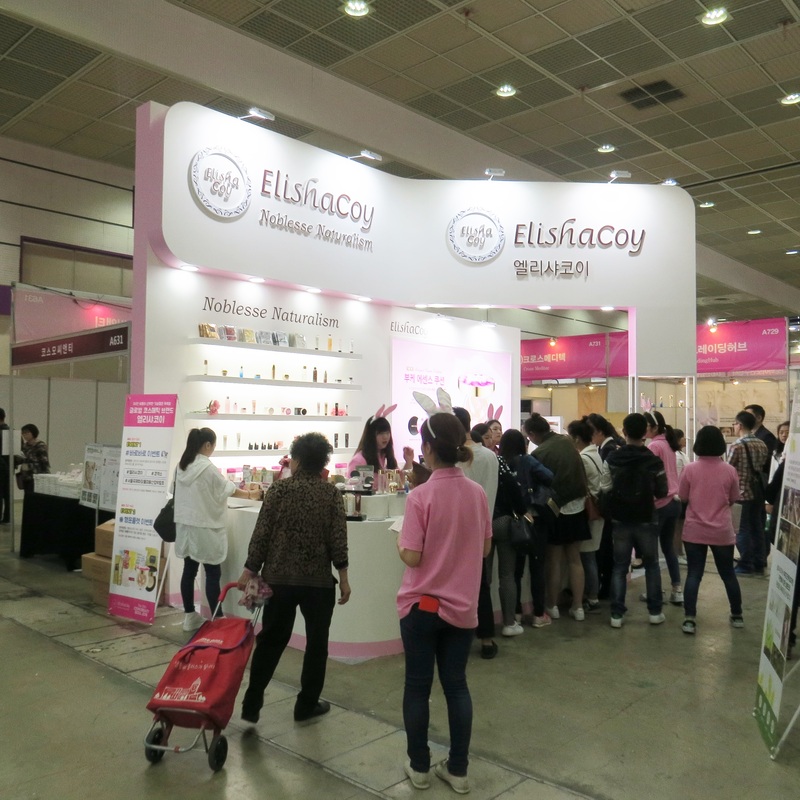 Cosmobeauty was much busier than Beauty Expo: the exhibitors included some of the bigger brands from Korea and there were a number of well-known European brands, too. Most of the exhibitors came from the retail cosmetics sector but there were also several salon brands, OEM/ODM manufacturers and even some packaging companies (most of these were from China). And in time-honored trend-traveller tradition: here, in no particular order, are some of my favourite brand discoveries from Cosmobeauty Seoul 2016! 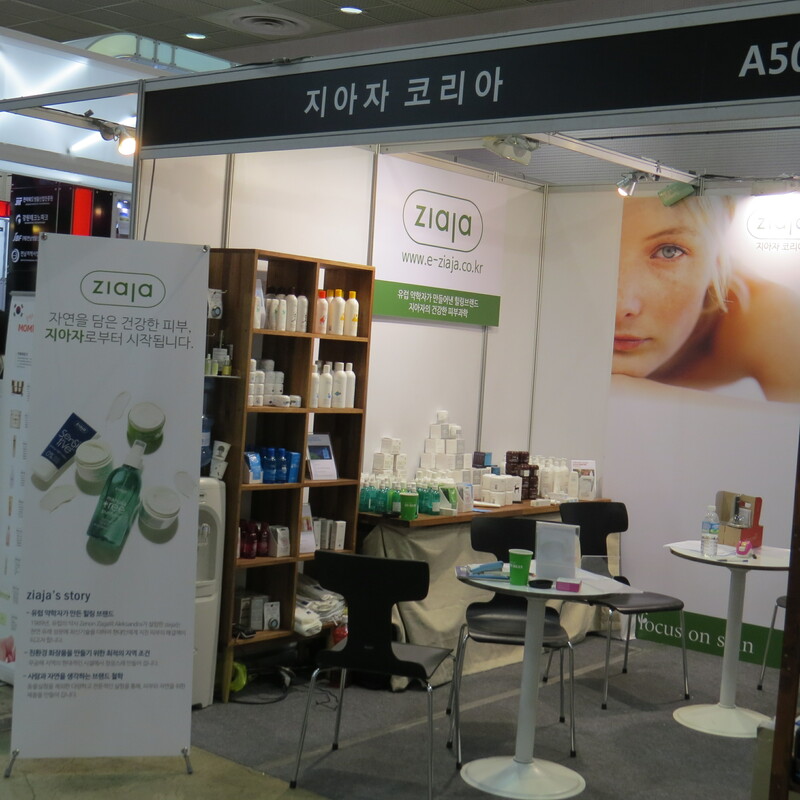 One of the very first exhibition booths I saw when I entered Hall A was Polish mass market brand Ziaja. I like Ziaja; around twelve years ago I interviewed one of the company’s founders for an article on the Polish cosmetics market. Such a long time ago! Anyway, Ziaja has a pretty solid distribution across Europe; you can also find some of their products in German drugstores. And there the company was at Cosmobeauty! 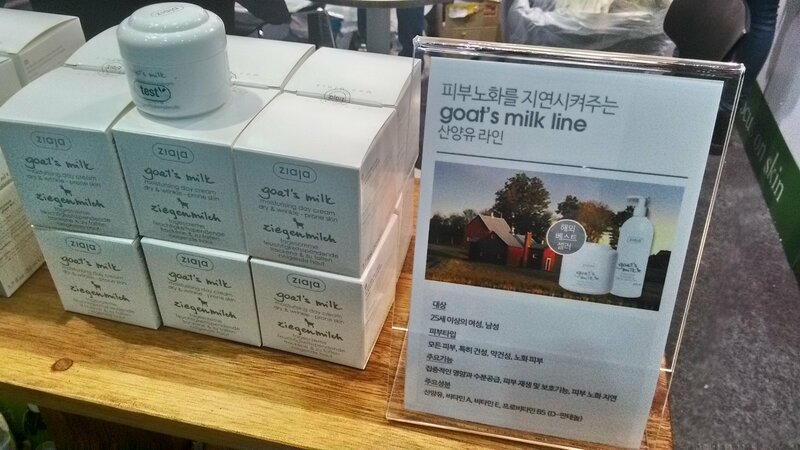 At their corner booth Ziaja presented its line-up of product ranges; the Goats Milk range is one of their international best-sellers. 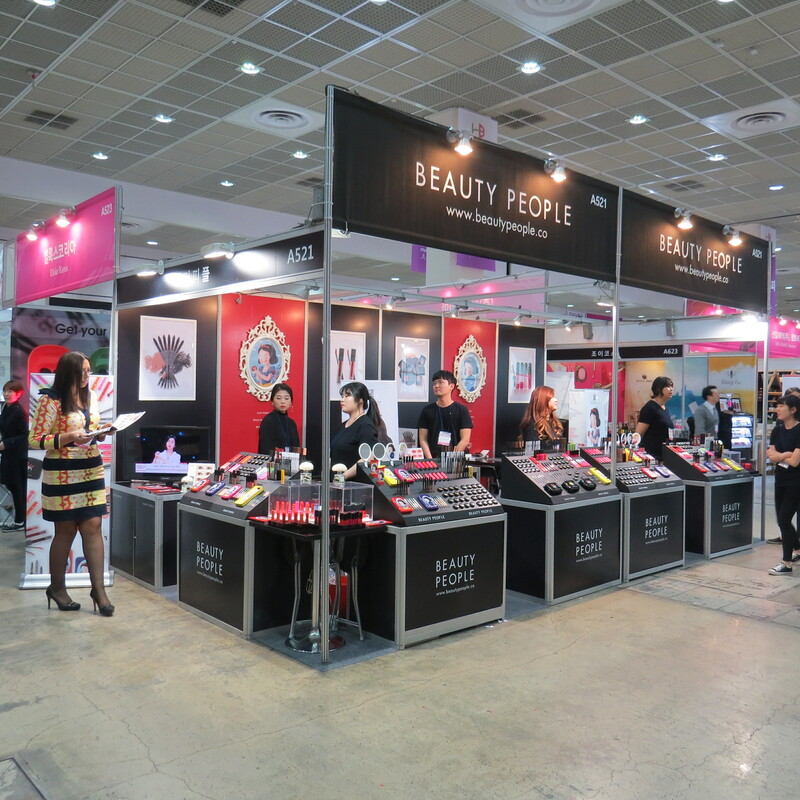 Beauty People is a Korean colour cosmetics brand (they also make some skin care and accessories) which I first met at International Beauty Expo last year. I quite like their stylish-looking makeup products and they seem to have a solid presence at the big Asian trade shows. 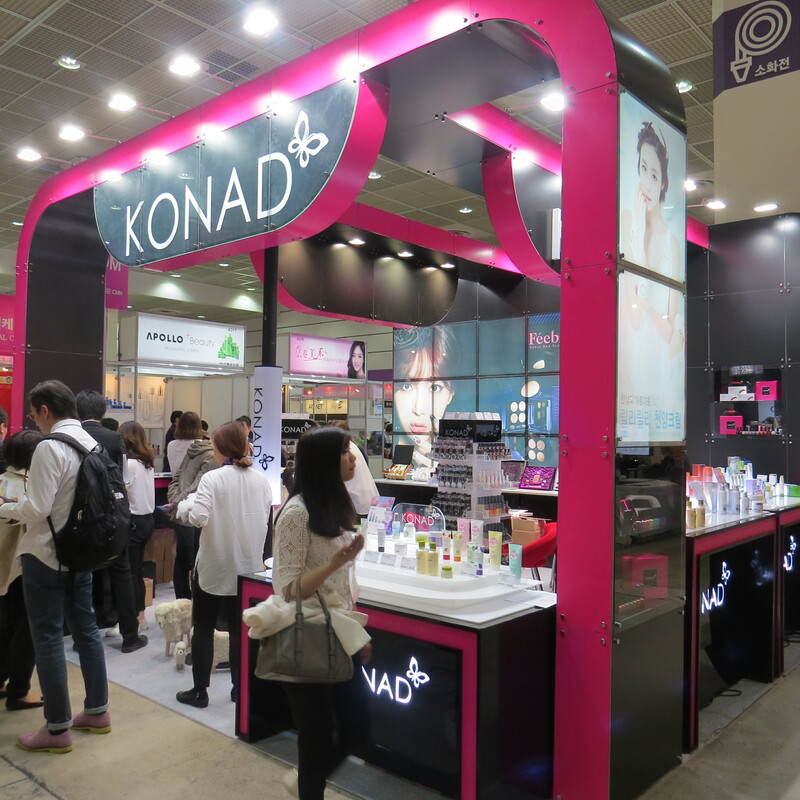 Three other big Korean brands that I keep seeing at trade shows in Asia are makeup brand Konad, colourful teenage brand Fascy and the popular and widely distributed skin and body care brand Elishacoy. 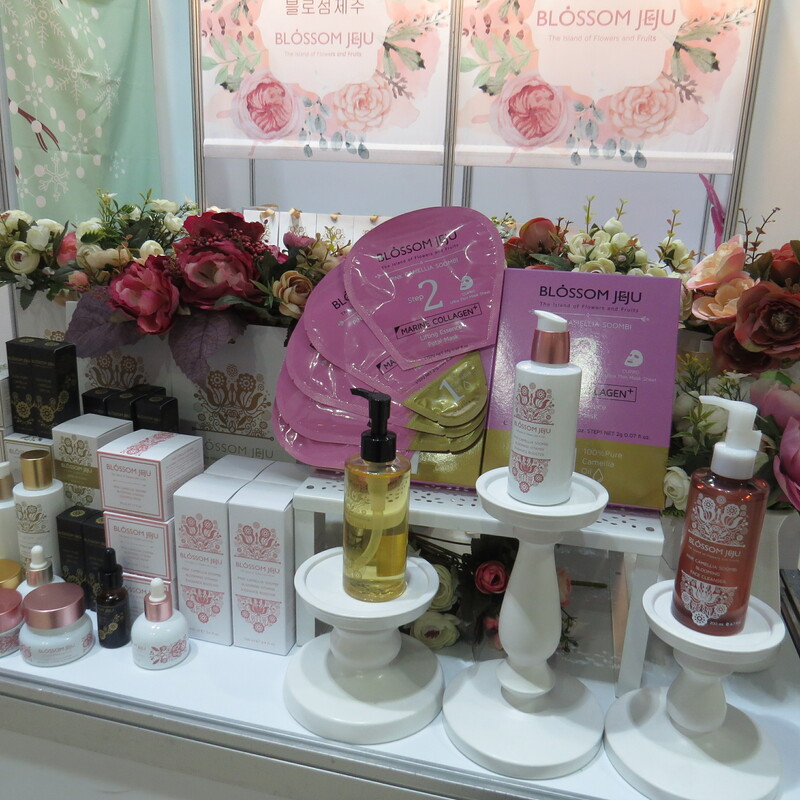 Another familiar face was Blossom Jeju, a premium organic beauty brand from Korea’s famous Jeju island. I first met Blossom Jeju at Cosmoprof Asia 2015; I had also seen their products in Korean perfumery chain Belport’s Itaewon store. They were also at Cosmoprof Bologna this March. Blossom Jeju’s products are formulated with camellia oil and the brand offers two main skin care ranges: the 7-sku Pink Camellia Soombi and 6-sku Camellia Soombi; there is also a lush 100% camellia oil and several sheet masks that complement the Soombi ranges. Beautiful packaging. 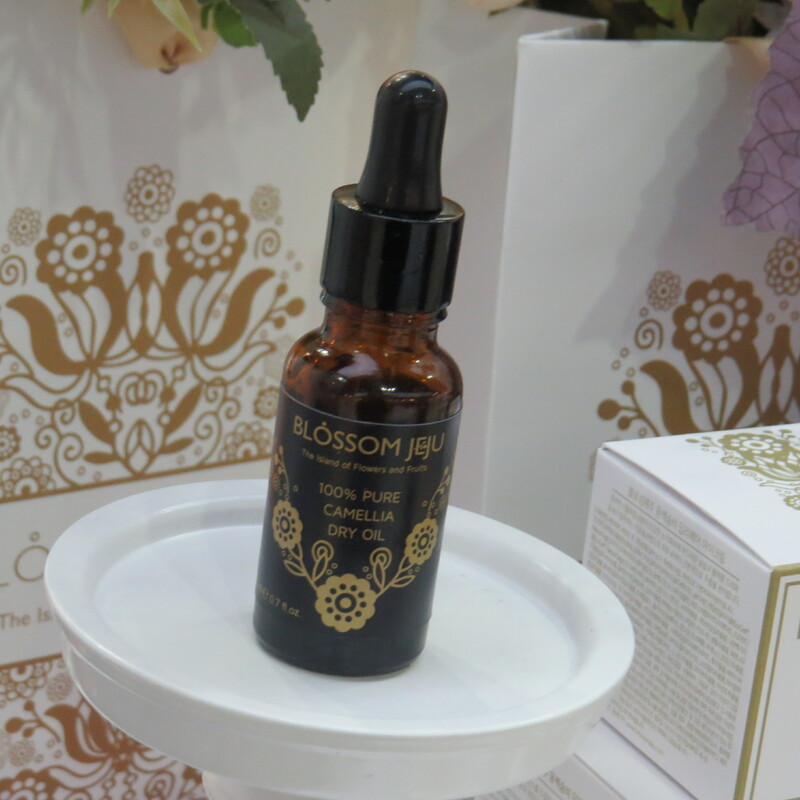 Blossom Jeju’s products are also available in the US, in Hong Kong (for example in the Lane Crawford department stores) and in the UK (through online store Cult Beauty). And the brand is currently stepping up expansion in Europe; Sungna Kim, CEO of Blossom Jeju, told me that the company has just started the official EU product registration process for Blossom Jeju. Kim said that the UK, Germany and France are three of the most interesting European markets for Blossom Jeju. However, there has also been considerable interest from Scandinavian buyers, she said. Old acquaintances from Europe and the US were C&T company Farmona from Poland (which I last saw at Cosmoprof Bologna this March), olive oil soap manufacturer Olivos from Turkey (International Beauty Expo 2015) and Dr. Bronner’s from the US (they make liquid castile soaps which are sold in colourful bottles; you’ve probably seen them around). I also met Amanprana from Belgium: the brand is well-known in Germany and the company regularly attends Vivaness/Biofach trade show in Nuremberg. It was Amanprana’s first appearance at a trade show in Korea; the company is keen to expand its distribution in the Asian region. Amanprana specializes in skin care oils and balms but the company also sells organic and fair trade coconut products, oils and spices and a range of other food products. Amongst their beauty ranges the European best-sellers include the Razoli Shaving Oil for Women which is based on olive oil, coconut oil, red palm oil and sweet almond oil and the Shangri-La skin care oil which combines sweet almond oil, olive oil and red palm oil with a number of essential oils such as vanilla, bergamot, thyme, curcuma and sage. Not far away from Amanprana was the exhibition stand of Coesam from Chile. The Coesam group is one of the biggest organic rosehip growing/distributing companies internationally. In addition to wide range of rosehip supplements, rosehip teas and so on, Coesam also offers a beauty range which is manufactured in Korea. 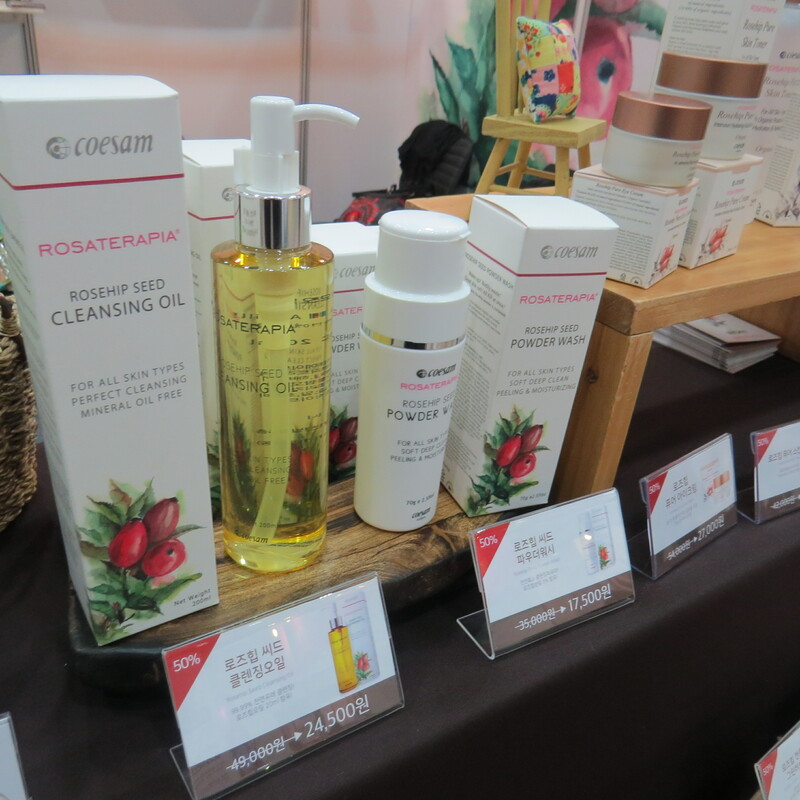 The Rosaterapia range of rosehip products (picture above) include s a cleansing oil, a cleansing power, eye cream, face cream, toner, essence and hand cream as well as sheet masks and rosehip oil capsules. 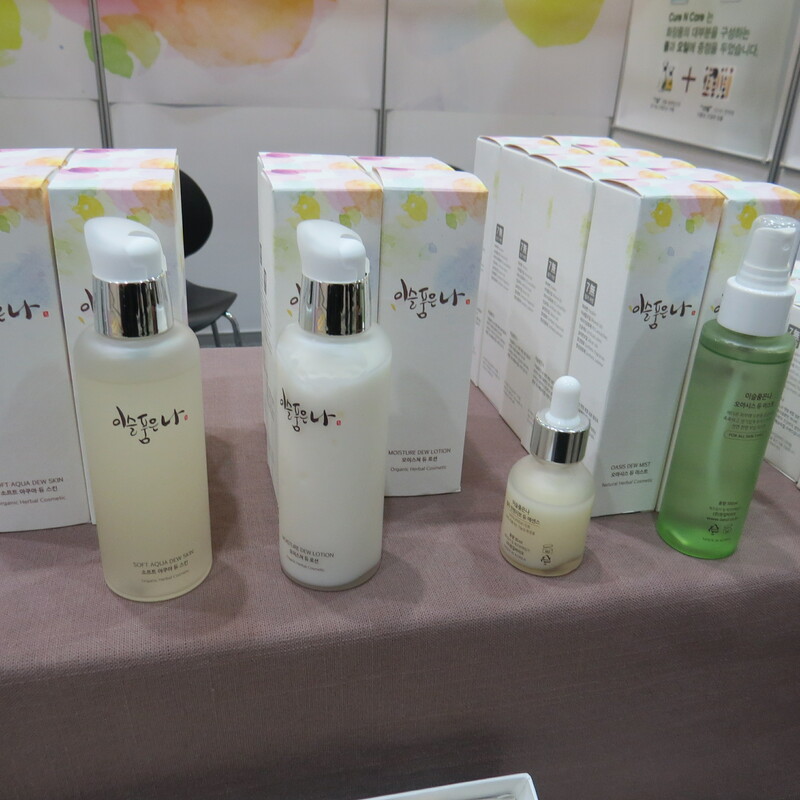 German organic certifier BDIH was also at Cosmobeauty. BDIH was the very first association to certify organic beauty in Germany; a few years ago they joined the Cosmos standard which also includes Ecocert, Cosmebio, Soil Association and several other European organic certifiers. 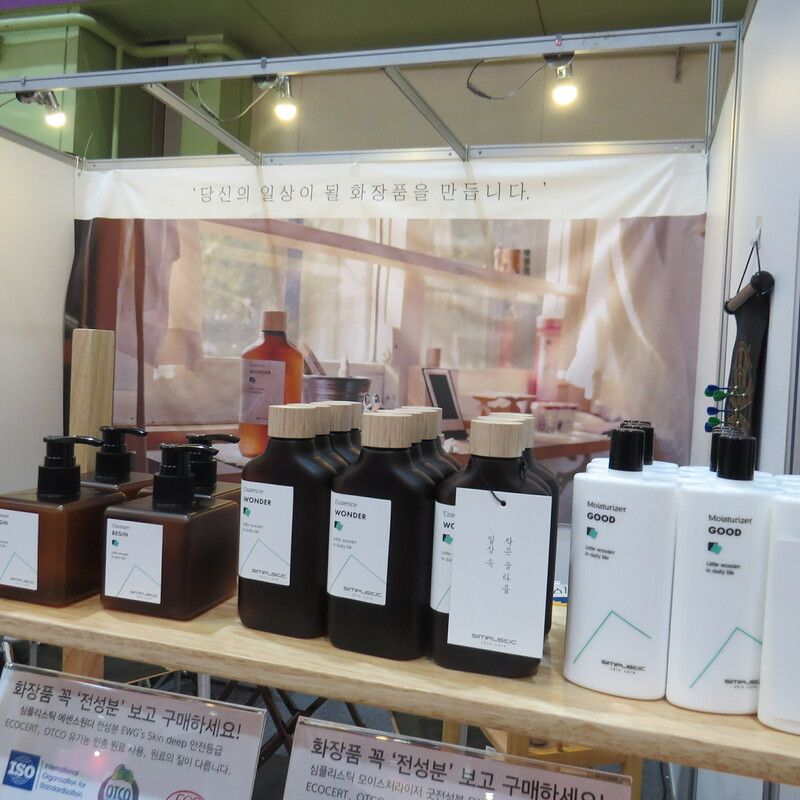 It was BDIH’s first trade show visit in Korea; over the last few years they have certified quite a few Japanese and Korean beauty brands (my Korean BDIH favourite is, of course, Whamisa!) and they are currently stepping up their activities in the Asian region. I regularly check the BDIH website to see if they have added any international beauty brands to their roster. I was really excited to see Korean mask manufacturer Lindsay at the trade show. Lindsay is a salon mask brand; they are the company responsible for kick-starting the rubber mask trend in Korea! 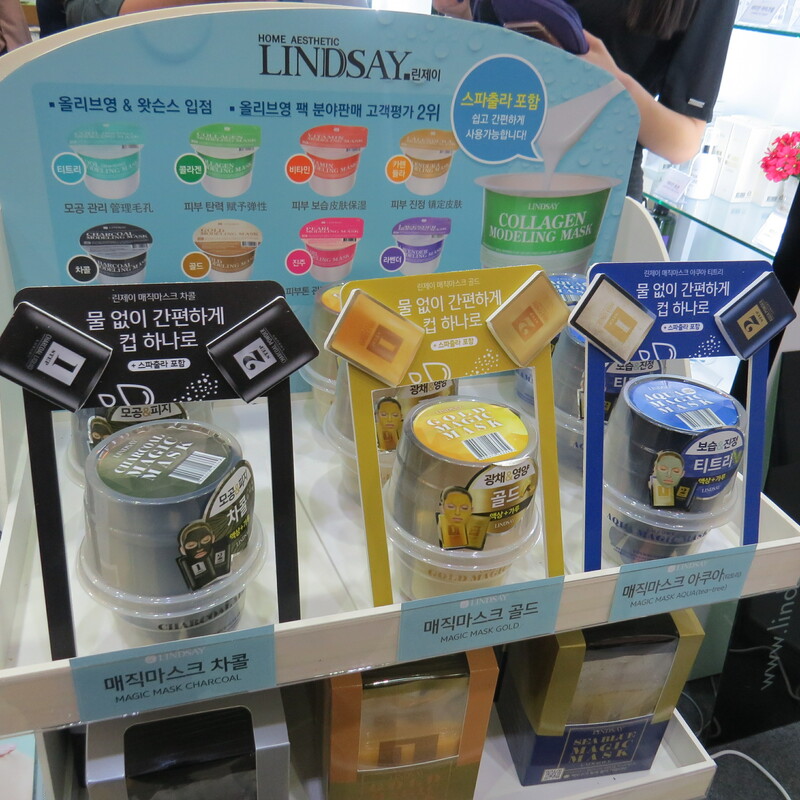 The Lindsay retail range of face masks is distributed widely in Korea (all four domestic drugstore chains – LOHBS, Watson’s, Boons and Olive Young – stock them) and the masks have appeared on scores of Asian and international beauty and lifestyle blogs. I first came across Lindsay when Julia from organic beauty blog Beautyjagd asked me to bring her a Lindsay mask from Korea. I bought one for her and one for myself and was hooked. Of course the rubber masks aren’t really made from rubber! The mask powder combines kelp-derived alginate and diatomatious earth as well as other ingredients. You stir the powder together with water, slather the thick jelly-like mass onto your face and let it harden. Then you just pull off the entire mask in one go. Rubber masks (they are also called “modeling masks” over here) are fun to use (albeit a little messy) and they are beautifully cooling and refreshing. Anyway, Lindsay’s rubber masks are usually sold in little plastic pots (see picture below; there is a little spatula in the lid): you take off the lid, fill the pot with water and then start stirring. At Cosmobeauty Lindsay presented their entire product portfolio (which included quite a few face oils and serums) with pride of place given to the face masks! There were two new mask pack designs which I thought were quite ingenious. 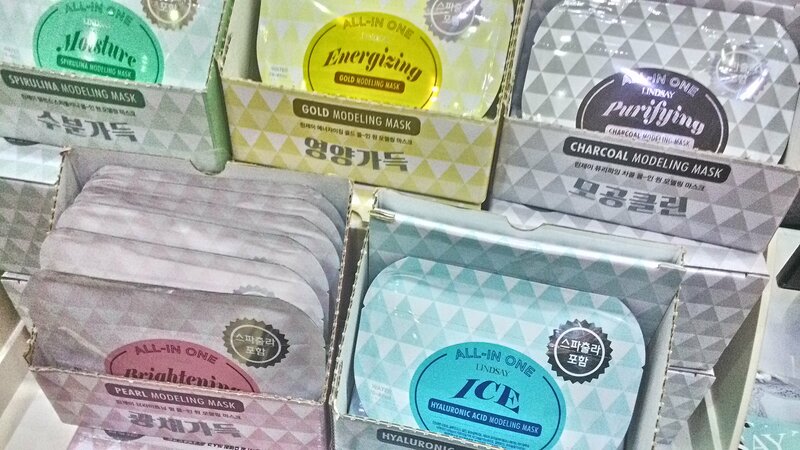 The All-in One Powder Mask (see picture above) contains the usual mask powder but it is packaged in a flat foil pack instead of a pot. You can fold out the pack so that it forms an oblong basin shape, cut off the top, fill the foil pack up with water and then stir up the mask. There are five varieties: Moisture, Energizing, Purifying, Brightening and Hyaluronic Acid. The second innovation is the Luxury Magic Mask (picture below): a larger plastic pot which looks a little bit like a cocktail shaker. The pot contains two sachets: one with the mask powder and one with a liquid; there is also a little spatula. Pour the liquid into the powder and stir. I’ve already decided to take a closer look at the Lindsay masks soon. 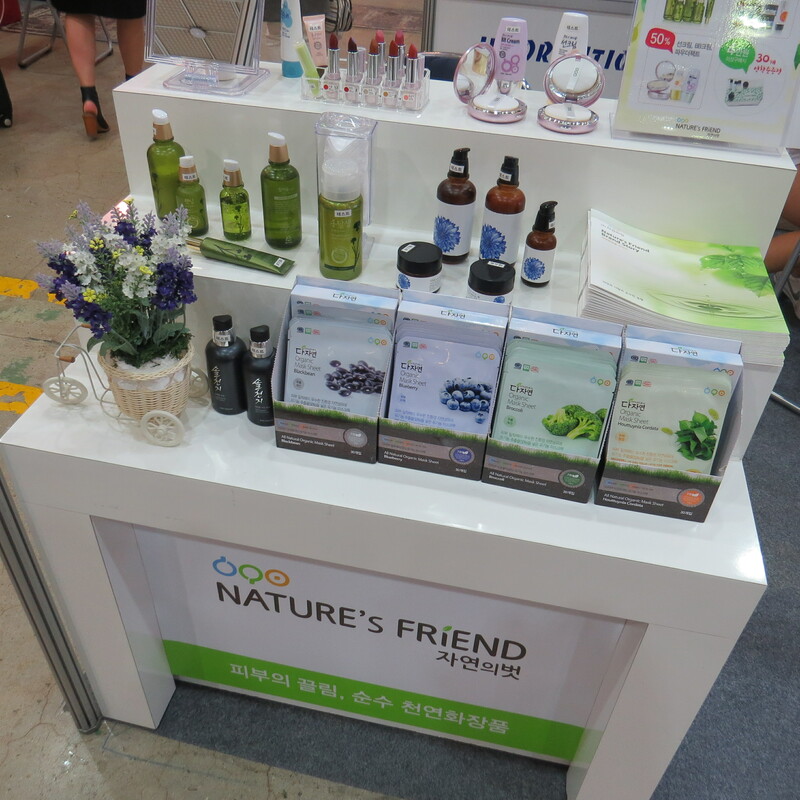 Nature’s Friend is a Korean company which was founded in the mid-1990s. 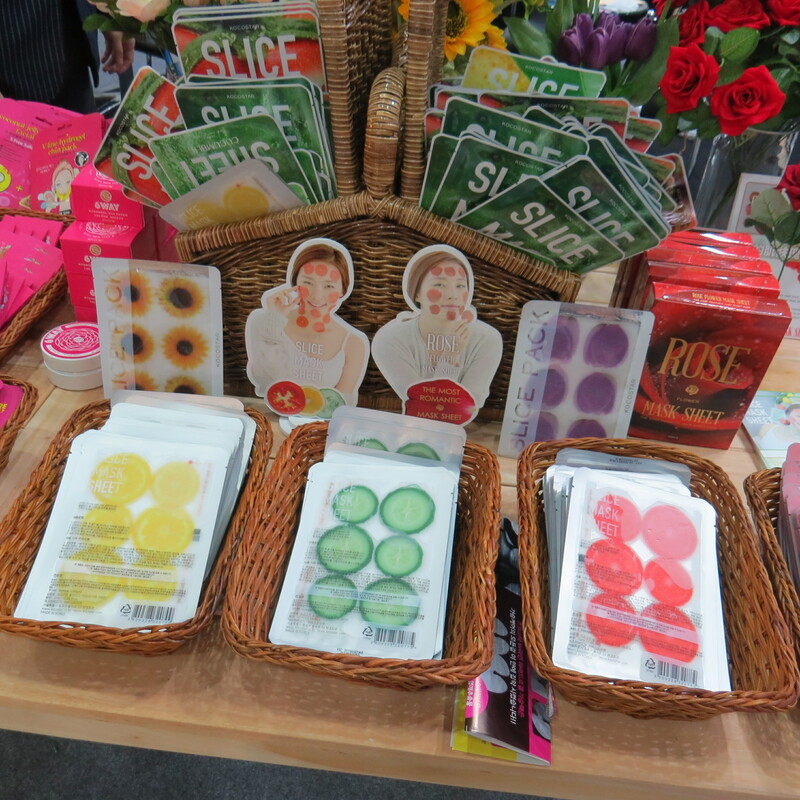 I was walking past their exhibition stand and simply had to stop and admire their broccoli sheet masks! With Ecocert-certified ingredients, no less. Anyway, Nature’s Friend appears to be more of a niche brand, their products are mostly retailed online. I liked the beautiful packaging of their products: there is the Blooming range for skin ages 20-30 years; a product range for more mature skin (packaged in gorgeous olive green glass bottles), two men’s care products, baby care and sun care, two bar soaps, several lipsticks and four sheet mask varieties: blueberry, the afore-mentioned broccoli, black bean and houttuynia cordata (English-language common names for this plant include chameleon plant, lizard tail, fish mint and heart leaf!). 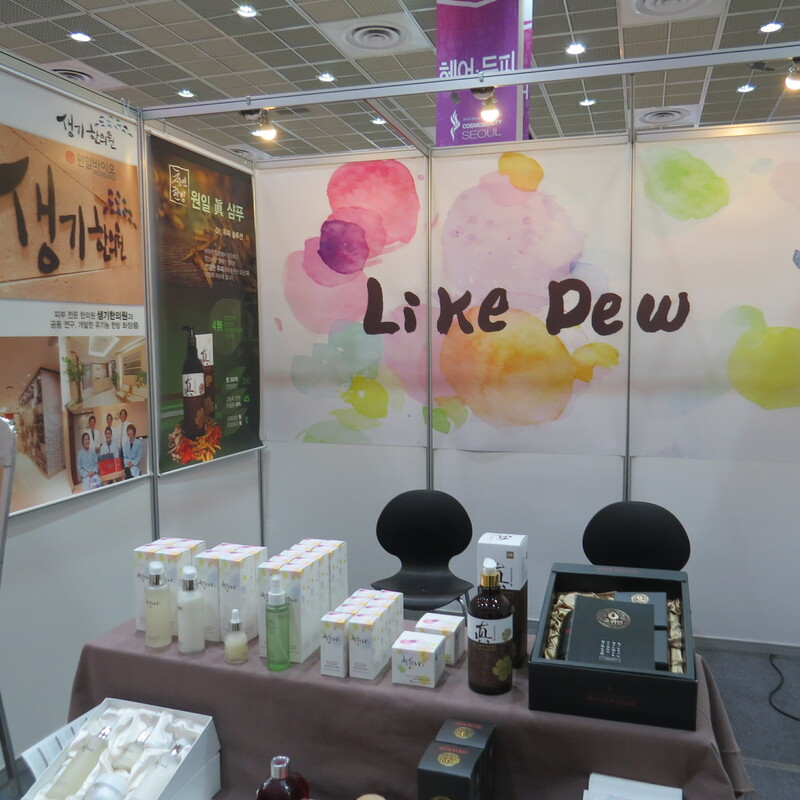 A charming organic brand from Korea was the TCM-inspired Like Dew beauty range (picture above and below). The manufacturer, Wonilbio, was founded two years ago and the company’s product portfolio also includes supplements and herbal foods. The Like Dew products are based on organic licorice water rather than the usual purified water and although the products were not certified organic, the ingredients looked pretty promising. Nice textures and a subtle herbal fragrance. Like Dew is primarily retailed online through the company’s own webstore and the products are priced between 24.000 KRW and 32.000 KRW (approx. 18-25 Euro). 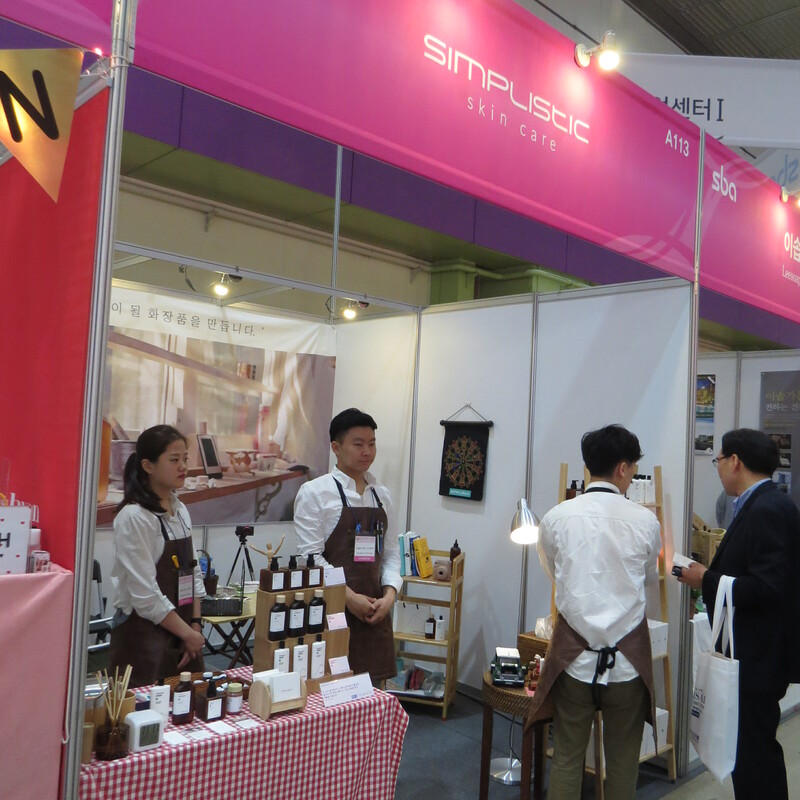 Korean beauty company Simplistic was founded just ten months ago. They have a rather unusual brand concept (unusual by Korean standards): a three-sku unisex beauty range which consists of cleaner, toner and moisturizer. The packaging is clean, simple and very stylish (brown jars and bottles, white cardboard outer packaging) – and in a market, where beauty packaging tends to be colourful, elaborate and, from what I could see so far, strictly gendered, the Simplistic products (see the pic below) really stand out visually. Now prepare for something completely different: genetically engineered spider toxin! 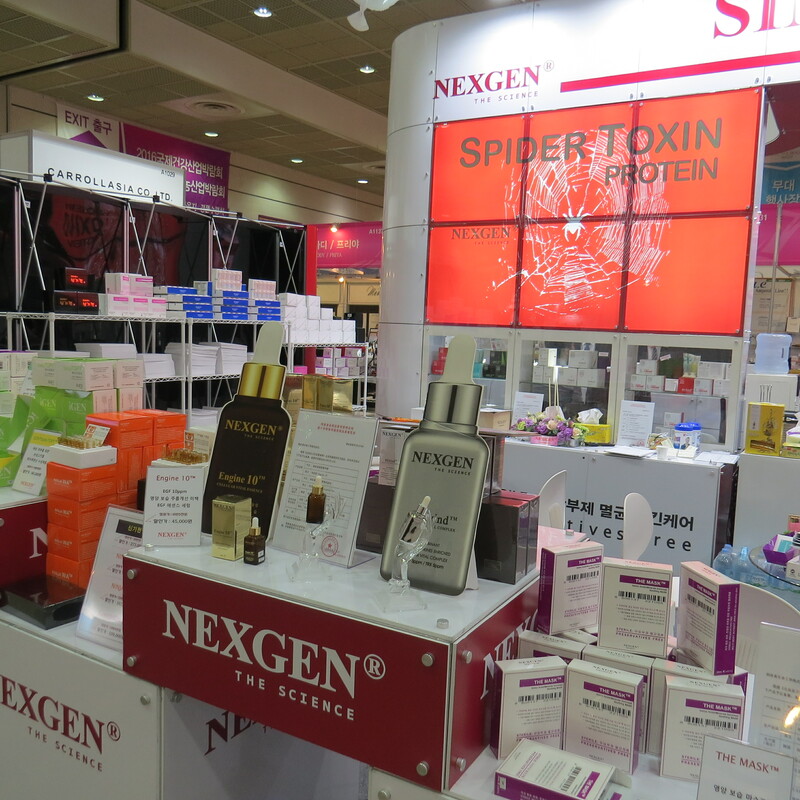 Korean cosmetics manufacturer Nexgen had a massive exhibition stand and they showcased their new proprietary spider toxin complex. As a matter of fact, Nexgen Biotechnologies also owns a number of other intriguing-sounding trademarks: Tesla Biometics, Spidertoxin, Spidervenom and Spiderpeptide. I was told that spider venom is an excellent anti-ageing ingredient. Does this mean that starfish, bees and snails are now being overtaken by spiders? I guess we’ll just have to wait and see. And if spiders DO turn out to be the new snail/bee/starfish: remember you read it first on trend-traveller.com. And on this note: I hope you enjoyed the article! Hi! Does A24 have a stand-alone shop in Seoul? Sadly, I don’t think A24 has an actual store in Seoul (I wish they did!). It is a US brand and I think their distribution in Korea is limited….the only stores I have actually seen their products are the LOHBS drugstores in Seoul and even they only carry a few A24 products. A24 manufacurer Innocosma has distributor addresses listed for Korea (http://kr.innocosma.com/), China, Asia-Pacific and Americas, Middle East & Europe (http://a24.innocosma.com/contact-us/). I have actually just e-mailed their US office to find out whether A24 is available in Europe at all! Hi, can I know if the expo is to get importers from different countries? Cause I wanted to go to find suppliers for skincare. Is this the right expo? You think? Hi Kath. I’m not from the import/export side of things so I’m not 100% sure, but yes, I think so. 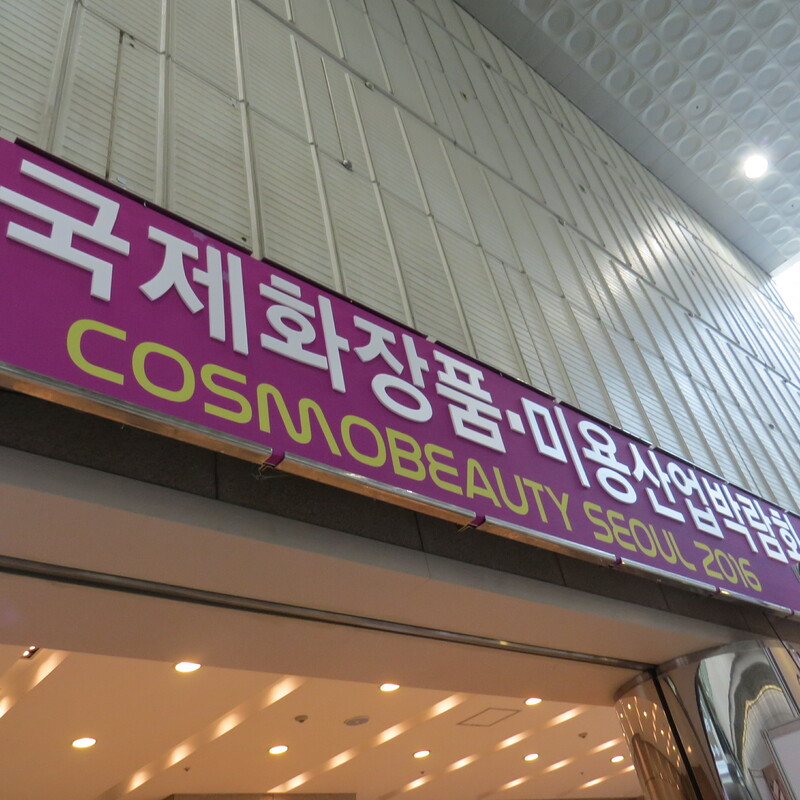 Cosmobeauty was definitely bigger than International Beauty Expo Korea (which I attended last October). 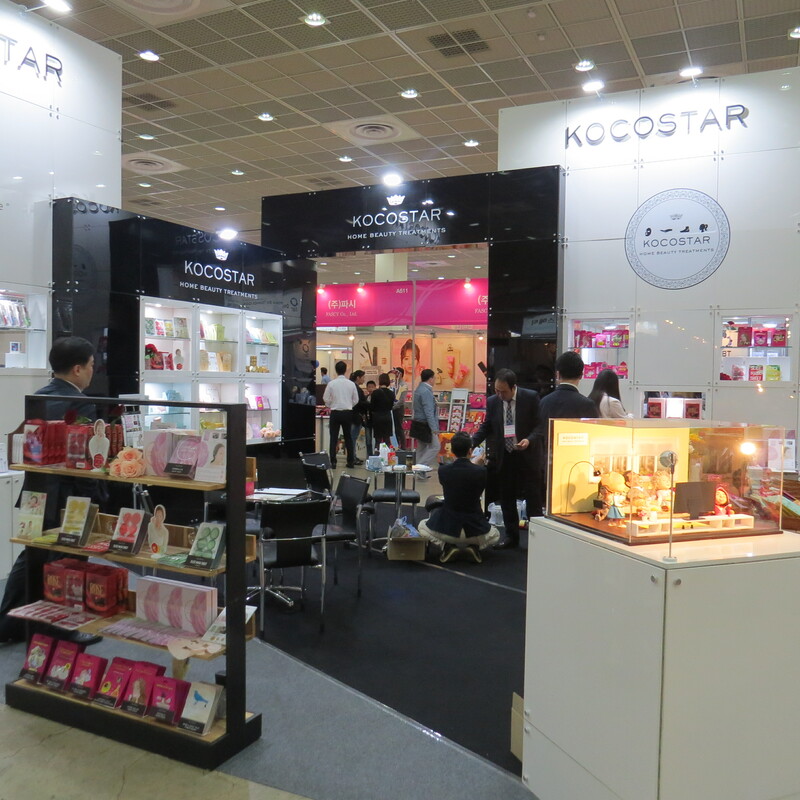 The exhibitors at Cosmobeauty 2016 were mostly Korean brands, both big companies with international distribution and new brands looking for distribution partners. Plus a bunch of Western brands that are sold in Korea and Asia already. It might be worthwhile to get in touch with the organisers of Cosmobeauty, I seems to remember that they had a kind of buyer/exhibitor event at the trade show, sort of a meet-and-greet.